UMass Amherst entomology professor Joseph Elkinton has recruited a first class coach in building a dream team to fight the European winter moth, an invasive import that has been defoliating trees in eastern Massachusetts at an alarming rate in recent years. That recruit just happens to be Mother Nature herself. The team includes Cyzenis albicans, a parasitic fly common in Europe where it generally controls winter moth outbreaks. In May, Elkinton’s research team released 2,000 of them in Wellesley’s Centennial Park with the hope of establishing the parasite in the local moth population. This kind of biological control program – using natural predators to manage pests – is at the heart of Elkinton’s work. He has spent much of his career studying enemies of the gypsy moth, a menace that has subsided in recent years thanks largely to a naturally occurring fungus. He is also researching Laricobius nigrinus, a beetle found in Idaho that appears to attack the woolly adelgid, which has destroyed entire hemlock forests in the mid-Atlantic states and continues to threaten trees in western Massachusetts. Elkinton was also part of the team, along with UMass Extension specialists Deborah Swanson and Bob Childs, who first identified the winter moth in this region. Hidden in a maze of hallways in UMass Amherst’s Agricultural Engineering building, Elkinton’s lab is a hive of activity. Post-doctoral researcher Dave Mausel hauls in armloads of hemlock branches bearing the distinctive white cottony adelgids he just collected on Mount Tom, while grad student Artemis Roehrig examines fly eggs under a microscope. Insectariums that are used to store and transport the flies and wasps called Agrypon flaveolatum (another winter moth predator) are stacked in a corner and are mostly empty after the recent release in Wellesley. Trays of winter moth cocoons infected with Cyzenis ablicans are also neatly stored and waiting to hatch the small moth-killers. Elkinton’s research team has collected as many as 250,000 winter moth caterpillars from a single tree in some of the most highly infested areas along the state’s coastal rim from the North Shore to Cape Cod, where millions of trees have been stripped of their foliage. “The densities are huge,” Elkinton says. “There are trillions of winter moths out there.” The lab has been racing to produce enough of the tiny flies to have an impact on the winter moth population in Massachusetts. The flies attack the moth by laying their eggs on leaves, which are then eaten by the green inchworm caterpillars. Once inside the caterpillars, the eggs hatch and the parasites devour their host, eventually emerging from the dead moth’s cocoon in spring. 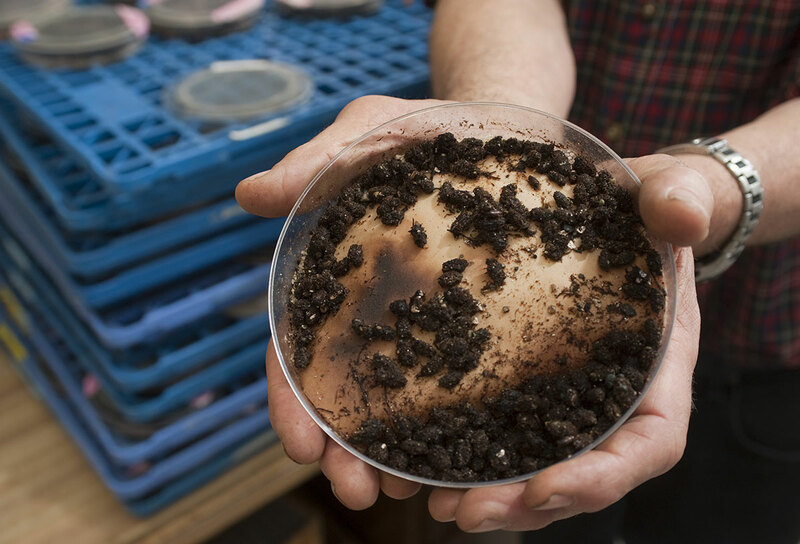 Initially, Elkinton and his researchers removed fly eggs under a microscope and fed them one-by-one to the caterpillars, which were kept in his lab’s growth chamber until they pupated, but that method of propagation was slow and labor-intensive. Now he collects moth caterpillars already infected with the parasite in British Columbia where an earlier infestation of winter moth was successfully controlled by the fly. “We think this will solve the problem completely because it has already worked in Canada,” Elkinton explains. The winter moth arrived in Nova Scotia in the 1950s and in British Columbia in the 1970s, but the pest has been completely controlled by the introduction of Cyzenis albicans there, a process that took about five years. Concerned that Massachusetts’ cold climate may prove too harsh for the fly, Elkinton is planning a trip to northern Norway this summer to study a winter moth outbreak there and to search for predators that might favor the moth in a harsher environment. Compared to using pesticides, biological control is a natural, non-toxic, and relatively inexpensive method of managing pests, but it can sometimes have adverse side effects. Elkinton’s research has found that a parasitic fly released in 1906 in an attempt to control gypsy moths also attacked other moth species. As a result, glimpsing the colorful and benign luna moth today is a rare treat. “It’s a difficult and lengthy undertaking to understand the dynamics of a population,” Elkinton explains, “but it’s very important to study the natural enemy and its host range. This fly is very specific to the winter moth – it won’t even attack other kinds of inchworm caterpillars,” he adds. Even the Bruce spanworm, a native species, which has hybridized with winter moths in some parts of the state but has its own set of predators keeping it in check, seems immune to Cyzenis albicans. “It’s neat to be working on this famous insect in a completely new situation and redoing this classic work in a different context,” Elkinton adds.